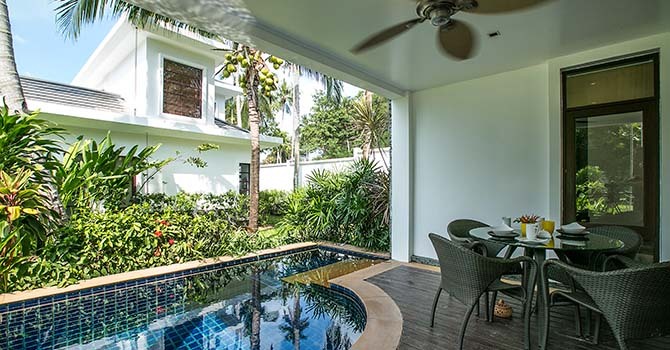 Heliconia Pool Villa, the 3 bedroom property features a uniquely shaped garden pool, a spacious living/dining area and a fully equipped European kitchen. 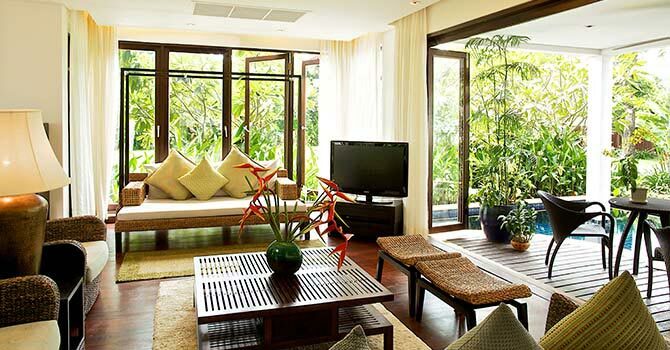 Lush gardens surround this quiet paradise as soft breezes rustle the swaying palms. Embrace the relaxed island life as you sit by the pool and enjoy a cool drink with friends, family or colleagues. All three bedrooms have private ensuite bathrooms ensuring ultimate privacy. The master bedroom has an adjoining balcony offering sensational views of the Gulf. 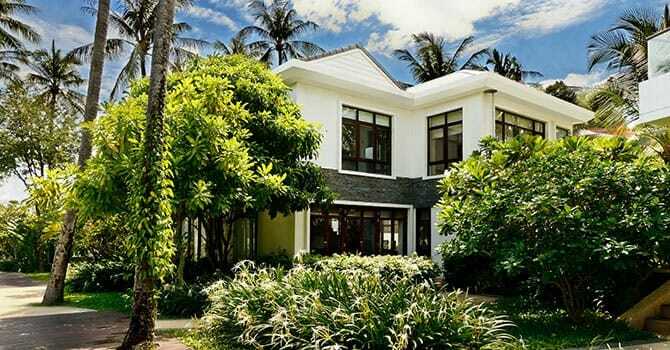 Designed to maximize living space, this villa is complemented with an extra spacious living/dining area and a fully equipped European kitchen. Heliconia comes complete with flat screen TVs, satellite channels, DVD, broadband internet, electronic safe, an iPod docking station and local mobile phone. 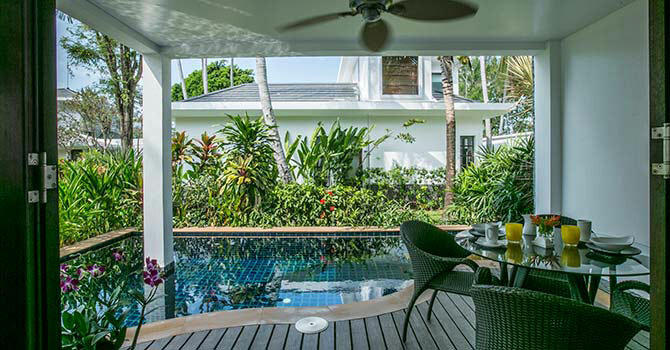 Located only a few steps from beautiful Bang Por Beach, you'll have direct access to Koh Samui's soft sands and turquoise seas right outside your door. The island's most exciting sights are all within a short drive from the villa. Each of the three bedrooms are stylish and elegant, with their own modern ensuite bathrooms. Rich hardwood floors and traditional accents add to the overall style, while large windows allow for ample natural light. The master bedroom offers an ensuite complete with relaxing bathtub, and opens up onto a spacious balcony with stunning views over the Gulf. Two further bedrooms are configured as twins, making the property ideal for families or groups. 9 minutes drive to Meanam Walking St. 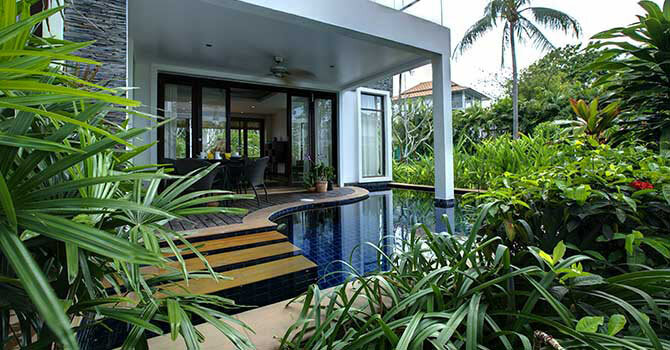 Wonderful stay Our family spent 2 wonderful weeks in the Frangipani Villa. It is not better. The whole crew, starting with Noi our maid who every morning made us a great breakfast, of course to the manageress Sue, who made everything possible and was always there .. Service like in a 5 star hotel. The house was well equipped, nothing was missing. The beach breathtakingly beautiful and very quiet. Everything was very well maintained. Highly recommended for families with small children.